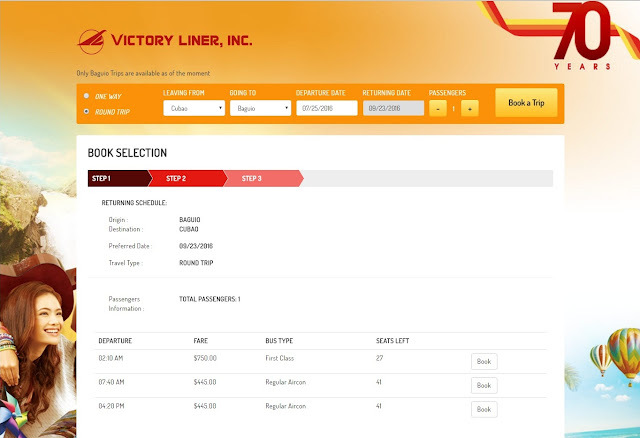 The Victory Liner Bus going to Baguio from Cubao and Pasay terminals can now be booked online. Before this method was introduced, you can only buy tickets at the terminal from where you will depart and not from any other terminal or branch of Victory Liner. 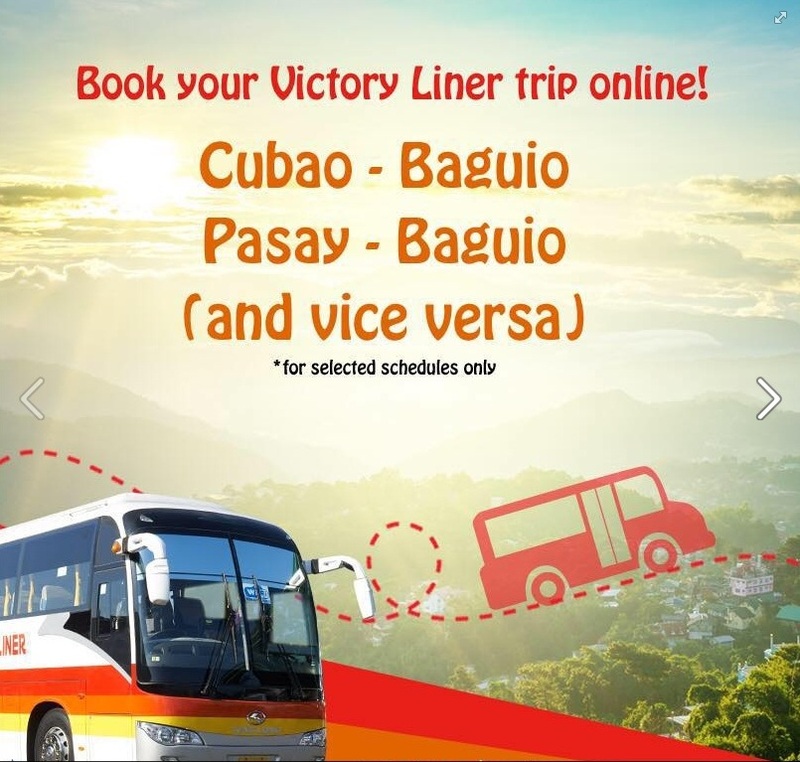 This means, you cannot buy the ticket in advance unless you're willing to go to Baguio, to book your Baguio to Cubao/Pasay trip, and vice versa. Most people just wait till the day of departure to buy tickets. This is inconvenient when it's peak season of travel and you're not sure of getting a ticket when you arrive there. With this new method of booking, you can book in advance from any location and be assured of a seat when you arrive at the terminal. 1. You need to have a VISA and MASTERCARD credit card that you can use to pay for the seat. 2. The passenger who will use the ticket must have a valid government ID. 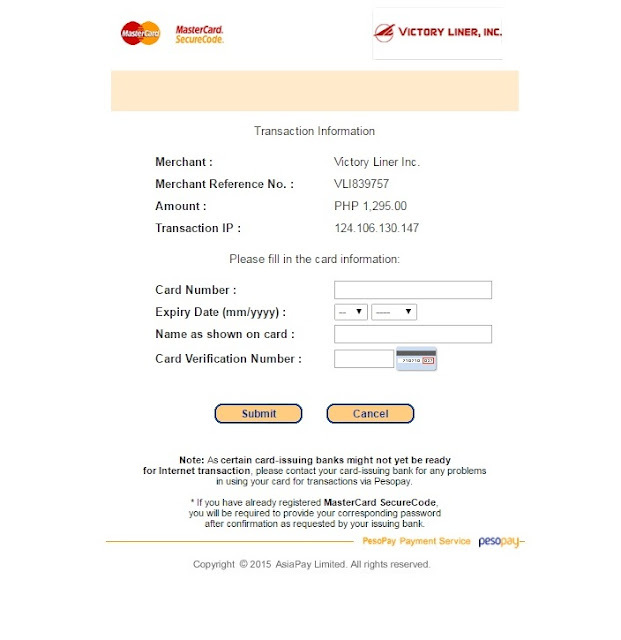 After you pay and book online, a voucher is emailed to you. 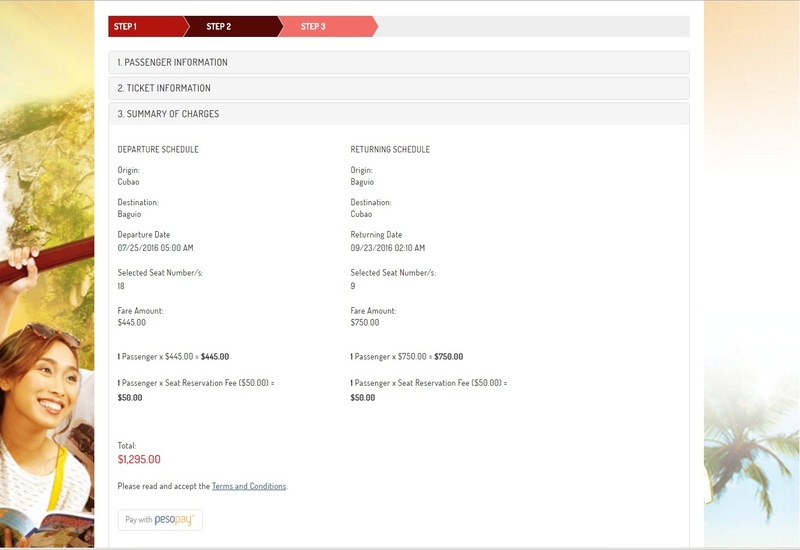 The passenger whose name appears on the voucher, must present the voucher and a valid government ID to be able to claim the ticket at the ticket booth in the terminal. 3. A senior citizen/person with disability/student, who wishes to avail of discounted tickets, CANNOT BOOK ONLINE. He/She must purchase the ticket at the terminal. 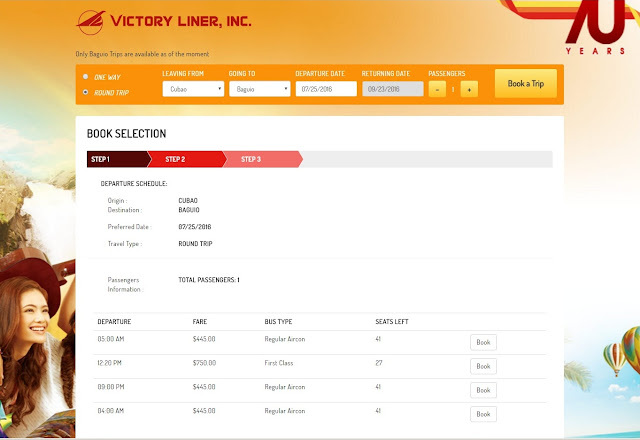 Discounted tickets cannot be booked online. The earliest trip you can book is a week in advance. 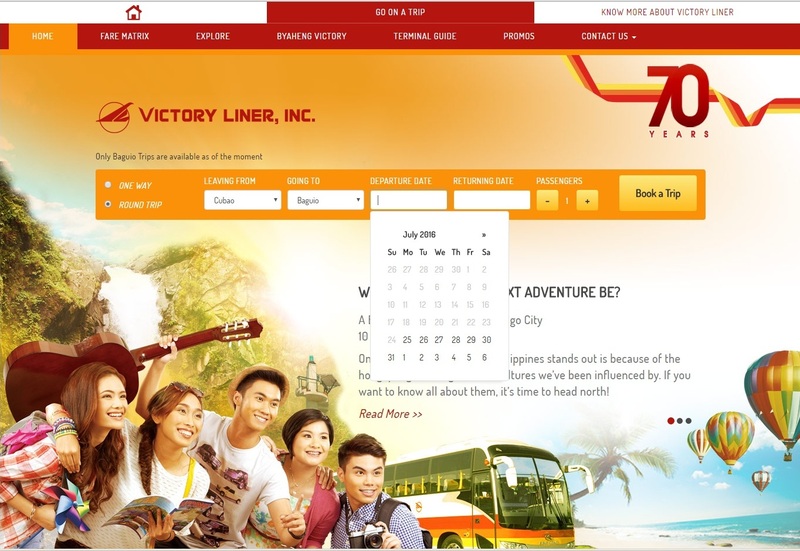 This means, if today is July 17, the earliest you can book is July 25. If you want to book a trip from July 18-24, you need to go to the terminal to buy the ticket. The latest trip you can book is 2 months thereafter. The bus company makes available for booking 2 months of trips. 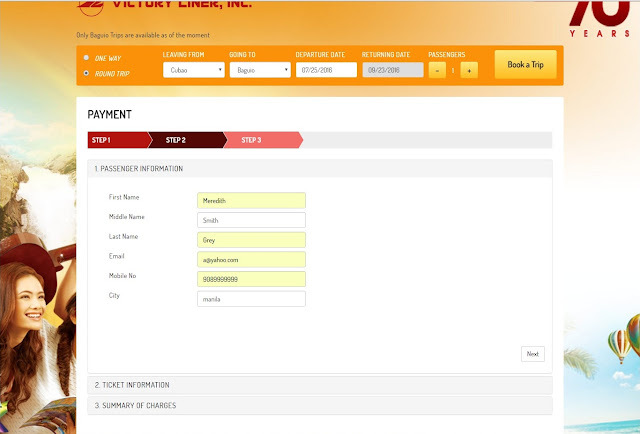 This means you can book trips as early as 1 week to 2 months in advance. You can book a minimum of 1 person up to a maximum of 10 persons in one booking. not all trips available for this route. The other time slots not included online can be booked at the terminal. 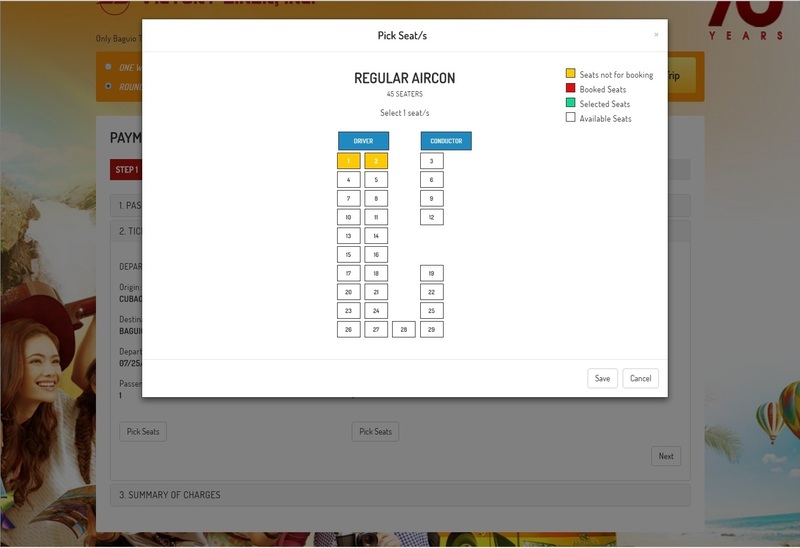 You must fill out all blanks to be able to go to the next page. You are required to choose your seat. Regular aircon buses have 45 seats. First class non-stop buses have 29 seats. The blank space you see on your right is where the toilet is located. 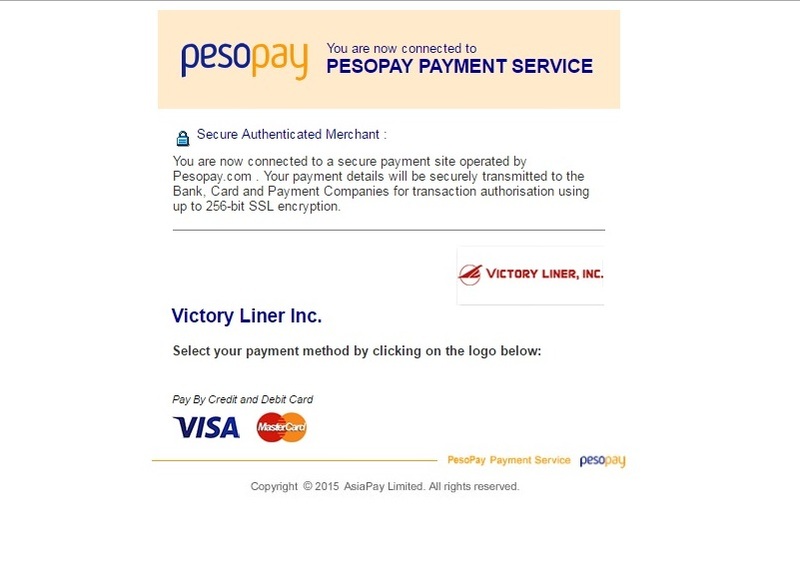 You pay a booking fee of 50 pesos per way. To be able to pay, you need to click the TERMS AND CONDITIONS portion first. This contains instructions on how to exchange your voucher for a regular ticket. 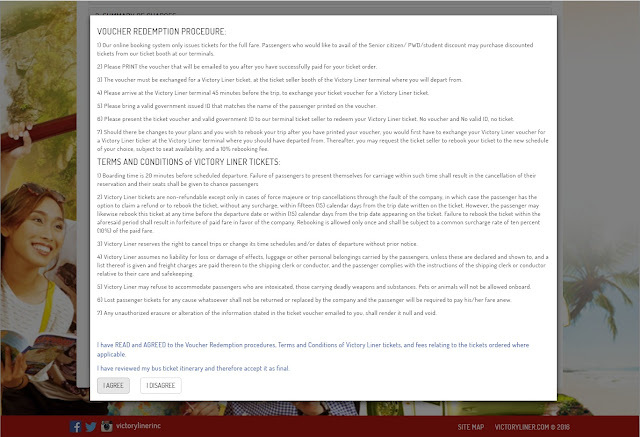 This also shows the cancellation and rebooking policy. Click "I AGREE" to be able to go to the next page. 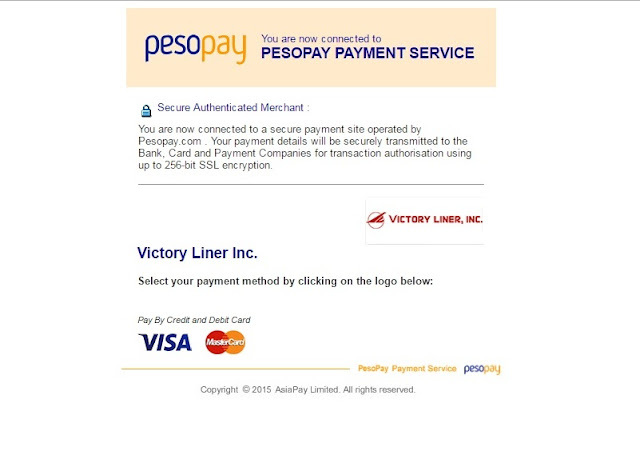 Click "Pay with Peso Pay". The cardholder does not have to be the passenger. 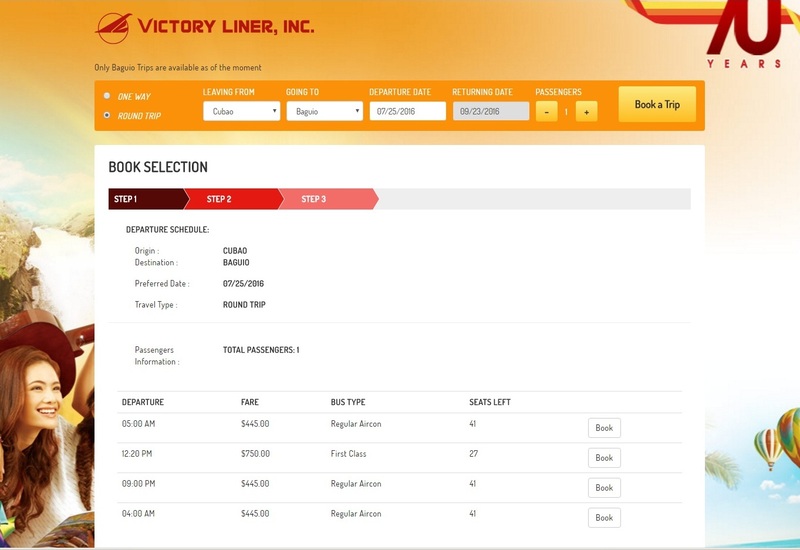 Victory Liner does not require the presentation of the credit card when claiming the ticket. 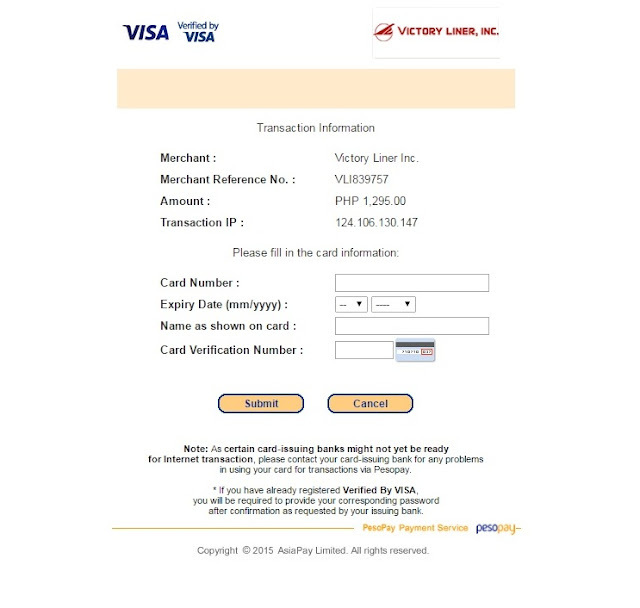 After payment, the voucher will be emailed to you. 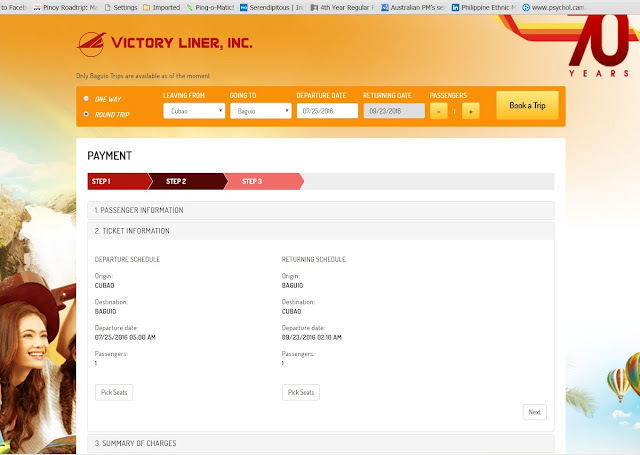 to be able to claim the ticket you will present when boarding the bus. NOTE: Tickets booked online are NON-REFUNDABLE but rebookable with restrictions, as shown in the terms and conditions. 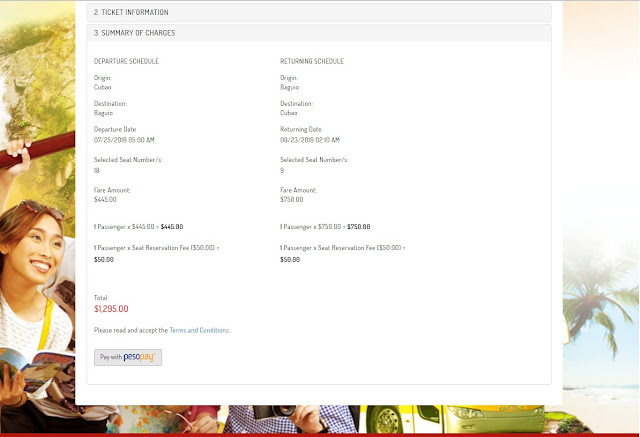 Tickets bought at the terminal are refundable but with 10% surcharge. NOTE: Not all times are available for booking online. There are more schedules available for purchase at the terminal.